These are the 7 stages an individual, company, even entire industries will have to go through in order to recover from the changed economy. What Mr. Obama and his administration does or does not do will not alter the fact that you must move through each of these stages in order to recover. The first stage is (1) Denial- the desire to NOT believe that things have changed, then once it become apparent that conditions are very different, people will enter (2) Anger and Blame, followed by (3) Bargaining or Hope. This stage is where individuals go through the process of trying to convince themselves that things are not so bad and/or that someone will come save them. Once it becomes obvious there is no savior people then move into (4) Apathy, thinking nothing can be done about their condition. In order to recover you have to move through this Apathy stage or you will become a statistics rather than a survivor. This decision to change your own condition will lead to the first phase of (5) Acceptance, actually False Acceptance. This is called False Acceptance because the actions taken at this stage will be consistent with the past and inconsistent with the magnitude of change in the economy and also inconsistent will achieving real results. Lots of effort is used in this false acceptance stage but few results moving individuals into the (6) Disappointment Stage. This stage results in signs of confusion, frustration and temporary lapses into more apathy until the true nature of the situation is fully confronted. The last stage, (7) True Acceptance, is when the individual embraces the severity of the situation and realized that old actions will not work and new skills, abilities and actions are needed in order to move forward. This final stage of Acceptance will breathe new life into the organization, reinvigorating the business at which point the people in the business with start to reinvent itself taking new actions and getting new results. At this time most of the population is bouncing between the 2nd and 4th stages, (the Anger/Blame, Bargaining and Apathy stages). This can be easily witnessed by the public’s current tiring of the media’s coverage of who is to blame. You can also witness mass movements of apathy as people cut spending in an effort to avoid anymore pain, shrinking themselves and their companies, even conserving energy, efforts and creativity as to how to produce their way out. In this stage all efforts go to retreat with individuals and businesses simply disappearing from the landscape. 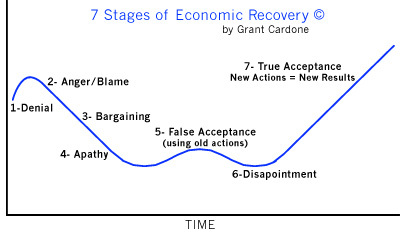 Those individuals and companies that will survive and succeed have already moved past the Apathy Stage and are now entrenched in first stage of acceptance (False Acceptance), where disappointment is experienced because actions and efforts employed (from the old economy) will not prove fruitful in the new environment. Because these people have a strong resolve to see their way out, they will quickly realize through their disappointments, that they under-estimated the degree of change in the market and start to move to the true acceptance stage and start to correctly estimate the changes and efforts necessary to move forward. 96% of those on the calls claim they are not just tiring of the media coverage and taking steps to counter it with training. Almost 80% of stated they are no longer concerned with who is to blame but rather what they need to do. Over 98% of this group expressed disappointment in their actions and realized they were in the False Acceptance stage. 75% agreed that they needed to learn new actions, new skills and new approaches for the new economy and that this change had to start with management. Almost 100% agreed that while their economy was problematic, it was not the actual problem. These types of realizations are critical to recovery as anyone who is stuck in the earlier stages of blame will not take action because they are using all of their energy and creativity accessing who is responsible instead of taking action to out-produce the situation. The stages to recovery are are not negotiable, only the speed at which you move through them is! Get honest with what has happened to your business as a result of the economy and immediately take full responsibility assuming no one will bail you out. Then identify where you are in the stages and what changes you will need to make going forward. Do not underestimate the amount of effort, creativity and persistence that will be required and prepare yourself with new skills and new actions. The skills that aided you in yesterday’s economy may not prove sufficient going forward!